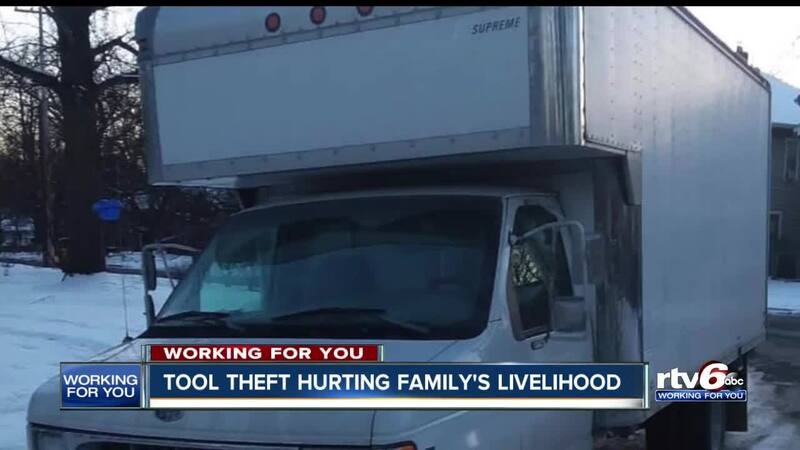 INDIANAPOLIS — On Saturday night, a box truck and thousands of dollars worth of tools were stolen from this Indianapolis family. When the crooks stole the truck, they took food out of this family's home. It's been a two year long process that Jody Niemantsverdriet has been customizing his truck. A truck he shared with a co-worker and his boss, who taught him the trade of carpentry. "I wanted to be a blessing for my boss because he's been a blessing for me," said Niemantsverdriet. His boss kept around $2,000 of tools inside the truck, along with Niemantsverdriet's tools valued at $10,000. "I woke up in the morning on Sunday, came out, and it was gone," he said. Niemantsverdriet and his wife took the story to Facebook to try and get help finding the truck. They found the truck behind a building off English Avenue — but all of the tools were gone. "How do you make do in the mean time? I was really concerned about that. I was like, I don't even have a hammer," he said. Niemantsverdriet will have to cancel several weeks of work. Making it difficult to provide for his family. It will be at least a couple of weeks before they hear back from their insurance company, and Niemantsverdriet is unsure if they'll cover all the damage. But he has faith. "The Lord will provide," he said. "Just have faith in him and he'll take care of it." Niemantsverdriet says, in the future, he will insist in stronger security and tracking systems. He hopes that others do the same. If you have any idea who stole the tools, call Crimestoppers.